Nikki Collister, a 2007 member of Pacific Crest, submitted this photo. 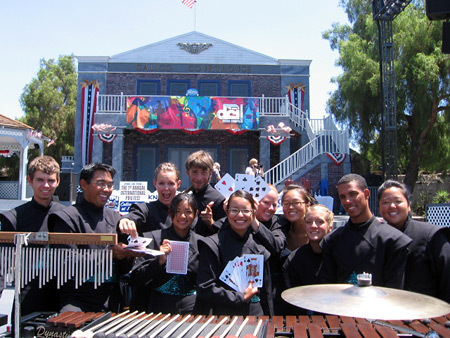 This photo is of member of the Pacific Crest front ensemble at DCI's first annual PB&J fest at Knott's Berry Farm in California in August of 2007. Before playing our show "What Happens In Vegas" for the audience, we did one of several 'photo shoots' using our jumbo-sized cards. The performance was really fun and it was too bad we couldn't stay for the contest especially since Emily is a champ at eating PB&Js! Since coming home from tour we've kept in close contact with each other through e-mail. After sharing all of our pictures, this definitely seems to be one of the favorites, and it has turned into a source of communication and many inside jokes. I miss all my fellow pit members and can't wait to see them again!